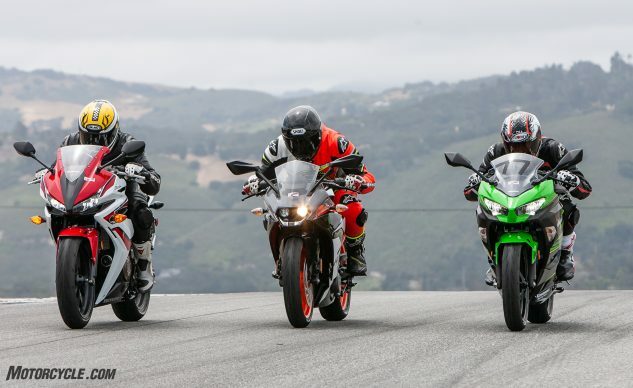 Onboard laps with the Honda CBR500R, Kawasaki Ninja 400, and KTM RC390 at the world famous Weathertech Raceway Laguna Seca. 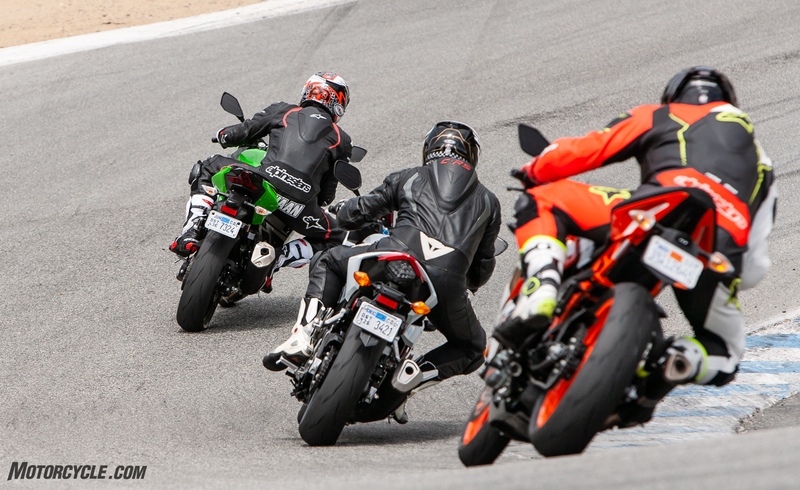 You’ve heard the adage a lot if you’re a consistent Motorcycle.com reader – it’s more fun to ride a slow bike fast than a fast bike slow – and with our recent Lightweight Sportbike Shootout we’ve gone ahead and proved it. By now we’ll assume you’ve already read the shootout, seen our conclusions, and also drawn your own; but what exactly do these three motorcycles look like at speed around Laguna Seca? This is your chance to see for yourself, as we’ve captured a quick lap aboard all three bikes, courtesy of Yours Truly. “Quick lap” is relative, of course, considering the relative lack of power these bikes make and because getting a clean lap without traffic was next to impossible. Still, these on boards reveal quite a bit. In the case of the CBR500R, I regret to inform you that the lap is far from exciting. But in many ways it is revealing. What it reveals is its excellent street manners, even while being taxed on a racetrack. There’s no sense of urgency with the Honda – a point most dramatically displayed as the CBR climbs the hill entering the famous Corkscrew. As it’s gaining speed, the power simply arrives in a linear fashion (albeit not very quickly), with hardly a peep coming out of the exhaust. It doesn’t get the heart pumping on track, but it’s sure nice to experience on the road. Though quiet, a quick glance at the speedo shows speeds far exceeding anything The Boys In Blue will let you get away with on normal roads. The Kawasaki Ninja 400 is quite the opposite of the Honda in the fact that it loves to rev. Just listen to it in this video as it carries revs all the way to its 12,000rpm redline! The 400 does flatline a little near the top of its rev range, which is something I’m sure the aftermarket is working on sorting out. A gear position indicator is also a nicety in this price category, which is also a curious omission on the Honda. Back to the Kawi and you can also see the Ninja’s ability to carry a line fairly well. This is more impressive considering its non-adjustable suspension it carries from the factory. It’s difficult to notice in the video, but the KTM requires its rider to be on top of their shift points. You can see the shift light is illuminated nearly the entire lap in the video; this is partially because we were constantly revving the bike near its limit, but also because the light on our particular test bike was set artificially low – possibly to limit the kind of abuse we gave it. Still, you can argue the KTM gains speed faster than the Kawasaki, though without a clean lap for each bike it’s a little hard to definitively determine. The KTM definitely has the chassis advantage though, as the RC390 with its wide bars can practically be put anywhere the rider chooses. Riding the Honda CBR500R, Kawasaki Ninja 400, and KTM RC390 around Weathertech Raceway Laguna Seca was an absolute blast for several reasons. First, riding motorcycles that don’t make 50hp is a lot less taxing on both the mind and body. Second, it also forces us to rely on the fundamentals – carrying corner speed key among them – to put in a decent lap time. And when you feel like you’re mastering the motorcycle instead of simply hanging on for dear life, riding becomes a whole lot more fun. Lastly, we can’t lie; passing other riders on our stock machines – complete with headlights, mirrors, license plate, turn signals, and even a horn(!) – does come with a little twinge of personal satisfaction.